North Korea in July test-launched two intercontinental ballistic missiles (ICBMs) capable of reaching the U.S. mainland. Such long-range capability, coupled with nuclear warhead advances, has been considered a U.S. redline that could draw a U.S. military response. North Korea’s rapidly advancing nuclear and missile programs pose a growing threat to the region and now the United States mainland, but the threat has not changed dramatically for South Korea, Japan, and U.S. forces based in the region. North Korea already maintains short- and intermediate-range missiles capable of carrying weapons of mass destruction or conventional high explosives, in addition to their conventional artillery and other forces. Yet, growing North Korean capabilities increase the stakes for military confrontation and reduce the time frame for diplomatic options. North Korea’s official Korean Central News Agency (KCNA) has asserted that the Hwasong-14 could carry a “large-size heavy nuclear warhead.”5 North Korea possibly is developing an even larger and heavier warhead than was previously claimed, such as a thermonuclear warhead. KCNA has made repeated claims that North Korea desires this technology, even claiming the January 2016 nuclear weapons test explosion was thermonuclear. In addition to the Hwasong-14, at least two other ICBMs may be under development. In April, North Korea paraded several missiles systems that were purported ICBMs, including two canisterized systems. Very little can be determined about these systems through open sources because not even the missiles were visible. Although it is possible to dismiss them, these are likely design concepts that are intended for development in the future. In 2012, for example, North Korea revealed a version of the KN-08 ICBM with poor welding and other design flaws that some analysts found suspect,6 until the design became more apparent in subsequent parades. In February, North Korea tested a new land-based missile with a solid-fueled motor. This missile, known as the Pukguksong-2, is nearly identical to the submarine-launched ballistic missile (SLBM) known as the Pukguksong. It is carried in a canister to maintain an optimal environment for the rocket. A solid-fueled motor offers several advantages over many North Korean missiles with liquid-fueled engines. North Korea rotates its many road-mobile missiles constantly around its territory and in and out of caves, tunnels, and warehouses to make them difficult for adversaries to locate and track. In 2011, U.S. Secretary of Defense Robert Gates said, “North Korea now constitutes a direct threat to the United States . . . . They are developing a road-mobile ICBM. I never would have dreamed they would go to a road-mobile [missile] before testing a static ICBM. It’s a huge problem. As we’ve found out in a lot of places, finding mobile missiles is very tough.”8 To track road-mobile missiles, military satellites typically track a configuration of known vehicles that travel in convoys. A solid-fueled missile likely needs a smaller convoy because it can travel prefueled without risking the same level of corrosion as a liquid-fueled one. In addition, a prefueled rocket will shave minutes off its launch time, making them faster to use in a conflict. North Korea revealed a new kind of transporter truck with the Pukguksong-2. This caterpillar-treaded truck is likely made at the tank factory near the launch site. This strange-looking vehicle likely appeared because North Korea can no longer procure wheeled chassis even illicitly. The treaded vehicles will present a different visual signature to the satellites tracking them. They likely are shorter range or need to be moved by rail, and they have a tighter turning radius and more difficulty on steep grades. Nonetheless, more launchers means more missiles, and they will add a dimension of difficulty to continually tracking road-mobile missiles, be they solid or liquid fueled. North Korea’s SLBM is also solid fueled. After several disastrous explosions and even some rather ingenious fakery,9 North Korea finally had a series of successes in 2016. Like the land-based version, North Korean SLBMs are meant to increase survivability by frequently rotating. They drive up resources needed for tracking the submarines. Unfortunately, the only way for North Korea to prove its capability is by inviting experts to examine the weapon or by testing it on a missile in a demonstration similar to China’s 1966 CHIC-4 warhead test on a Dongfeng-2 missile. At such a tense time, no one is encouraging that option. While many continue to question North Korea’s ability to build a re-entry vehicle (RV), it is likely they have already produced and tested one. In March 2016, Pyongyang distributed photographs of a re-entry simulation in Rodong Sinmun, the official newspaper of the ruling party. Much as is the case with the warhead, it is impossible to prove that the simulation was effective with photographs alone, although the method was the same that the United States used in the 1970s. Since the test of the intermediate-range Musudan ballistic missile in 2016, North Korea has been using a lofted trajectory to test its missiles. The purpose of this testing method may say a great deal about the crowded geography of Northeast Asia, but it also means that North Korea has been breaching the troposphere with its missiles for several months. The angle at which the missile descends is much sharper than if the missile were targeting the United States. In 1994, when U.S. President Bill Clinton contemplated the use of force to conduct a first strike on North Korea’s Yongbyon nuclear reactor, the Pentagon concluded that a war on the peninsula would result in 1 million dead and nearly $1 trillion in economic damage.15 This estimation was made well before North Korea possessed nuclear weapons and ICBMs capable of hitting the U.S. mainland. The human costs of any military conflict will only increase when taking into account Japanese and U.S. citizens, including U.S. soldiers and their families stationed in Japan and Guam. Within North Korea, internal displacement resulting from violence and instability means that a vast proportion of North Koreans will lack access to basic necessities and will be difficult for humanitarian agencies to reach.16 Furthermore, a Bank of Korea study predicts that 3 million refugees will attempt to cross into the South in a North Korean collapse scenario.17 A still greater number may cross the Chinese border. The United States, South Korea, and Japan remain extremely skeptical of negotiating with Kim, who has been consolidating power and fortifying his cult of personality since the December 2011 death of his father, Kim Jong Il. In addition to being a reprehensible regime with profound human right violations, North Korea long has been a spoiler, holding negotiations hostage for petty reasons and failing to meet their commitments as a member of the United Nations. Yet, misunderstandings and offense have been made and received on all sides. Although prospects for negotiations may seem dim, U.S. Secretary of State Rex Tillerson said in August that the United States could be open to talks if North Korea halts missile testing. If the United States and its allies get to negotiations, North Korea would likely seek political, economic, and security guarantees. North Korea has left one small window open. Following the first Hwasong-14 missile test, KCNA reported that Kim “stressed that [North Korea] would neither put its nukes and ballistic rockets on the table of negotiations in any case nor flinch even an inch from the road of bolstering the nuclear force chosen by itself unless the U.S. hostile policy and nuclear threat to [North Korea] are definitely terminated.”20 Even North Korea’s August statement about launching intermediate-range missiles to splash down off the coast of Guam was left open-ended based on the behavior of the United States. If North Korea will not immediately denuclearize and the United States will not accept a growing nuclear threat, the best option is to focus negotiations for a freeze, narrowing though they may be. Siegfried Hecker, a former director of the Los Alamos National Laboratory who has made seven trips to North Korea, has called for “Three Nos”: No more bombs, no more nuclear tests, and no more proliferation.27 To this might be added no additional rocket tests28 and no additional missile proliferation. These are very tall asks for North Korea, South Korea, Japan, and the United States, and the prospects for securing what everyone wants are low. The task at hand is to incrementally find those low-hanging and, if necessary, reversible agreements that will gradually build trust. The United States was able to negotiate with the Soviet Union under much tougher circumstances. The stakes for all sides are high, but the time for negotiation, however problematic, is now. The longer the wait, the greater North Korea’s technological capabilities will become, making diplomacy and war more difficult and dangerous. 1. “Kim Jong Un Inspects KPA Strategic Force Command,” KCNA, August 15, 2017. 2. U.S. Department of Defense Press Operations, “Department of Defense Press Briefing by Secretary Mattis, General Dunford and Special Envoy McGurk on the Campaign to Defeat ISIS in the Pentagon Press Briefing Room,” May 19, 2017, https://www.defense.gov/News/Transcripts/Transcript-View/Article/1188225/department-of-defense-press-briefing-by-­secretary-mattis-general-dunford-and-sp/. 3. Ankit Panda, “North Korea Just Tested a Missile That Could Likely Reach Washington DC With a Nuclear Weapon,” The Diplomat, July 29, 2017, http://thediplomat.com/2017/07/north-korea-just-tested-a-missile-that-could-likely-reach-washington-dc-with-a-nuclear-weapon/. 4. David Wright, “North Korean ICBM Appears Able to Reach Major U.S. Cities,” All Things Nuclear, July 28, 2017, http://allthingsnuclear.org/dwright/new-north-korean-icbm. 5. “Kim Jong Un Guides Second Test-fire of ICBM Hwasong-14,” KCNA, July 29, 2017. 6. Markus Schiller and Robert H. Schmucker, “A Dog and Pony Show,” Arms Control Wonk, April 18, 2012, http://www.armscontrolwonk.com/files/2012/04/KN-08_Analysis_Schiller_Schmucker.pdf. 7. 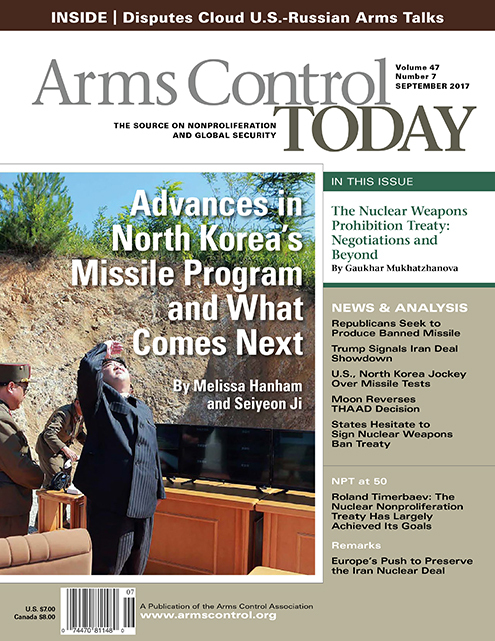 Ankit Panda and Vipin Narang, “North Korea’s ICBM: A New Missile and a New Era,” The Diplomat, July 7, 2017, http://thediplomat.com/2017/07/north-koreas-icbm-a-new-missile-and-a-new-era/. 8. John Barry, “The Defense Secretary’s Exit Interview,” Newsweek, June 21, 2011. 9. Catherine Dill, “Video Analysis of DPRK SLBM Footage,” Arms Control Wonk, January 12, 2016, http://www.armscontrolwonk.com/archive/1200759/video-analysis-of-dprk-slbm-footage/. 10. Joby Warrick et al., “North Korea Now Making Missile-Ready Weapons, U.S. Analysts Say,” The Washington Post, August 8, 2017. See Ankit Panda, “U.S. Intelligence: North Korea May Already Be Annually Accruing Enough Fissile Material for 12 Nuclear Weapons,” The Diplomat, August 9, 2017, http://thediplomat.com/2017/08/us-intelligence-north-korea-may-already-be-annually-accruing-enough-fissile-material-for-12-nuclear-weapons/. 11. Ankit Panda, “U.S. Intelligence: North Korea’s ICBM Reentry Vehicles Are Likely Good Enough to Hit the Continental U.S.,” The Diplomat, August 12, 2017, http://thediplomat.com/2017/08/us-intelligence-north-koreas-icbm-reentry-vehicles-are-likely-good-enough-to-hit-the-continental-us/. 12. “Counts of Active Duty and Reserve Service Members and APF Civilians by Location Country, Personnel Category, Service and Component,” Defense Manpower Data Center, February 27, 2017. 13. “War With North Korea Would Be ‘Catastrophic,’ Defense Secretary Mattis Says,” CBS News, May 28, 2017. 14. Jeffrey Lewis, “North Korea Is Practicing for Nuclear War,” Foreign Policy, March 9, 2017, http://foreignpolicy.com/2017/03/09/north-korea-is-practicing-for-nuclear-war/. 15. Don Oberdorfer, The Two Koreas: A Contemporary History (New York: Basic Books, 1997). 16. Bridget Coggins, “Refugees, Internal Displacement, and the Future of the Korean Peninsula,” Beyond Parallel, February 2, 2017. 17. Na Jeong-ju, “3 Million NK Refugees Expected in Crisis: BOK,” Korea Times, January 26, 2007. 18. The Six-Party Talks at a Glance,” Arms Control Association, July 2017. 20. “Kim Jong Un Supervises Test-Launch of Inter-Continental Ballistic Rocket Hwasong-14,” KCNA, July 5, 2017. 21. “DPRK’s Bolstering of Nuclear Force Hailed by Swiss Organizations,” KCNA, December 1, 2016. 22. “Moon Says Reducing Military Drills Not an Option, at Least for Now,” Yonhap News Agency, June 29, 2017. 23. Office of the Press Secretary, The White House, “Remarks by President Bush and President Kim Dae-jung of South Korea,” March 7, 2001. 24. Bruce Klingner, “Obama’s Evolving North Korean Policy,” SERI Quarterly Vol. 5, No. 3 (2012): 111. 25. Ri Hyon Do, “DPRK’s Nuclear Deterrence Is Treasured Sword of Nation.” Rodong Sinmun, June 29, 2017. 26. Kim Sung Gol, “Just Is DPRK’s Access to Nuclear Deterrent,” Rodong Sinmun, May 2, 2017. 27. Steve Fyffe, “Hecker Assesses North Korean Hydrogen Bomb Claims,” Bulletin of the Atomic Scientists, January 7, 2016, http://thebulletin.org/hecker-assesses-north-korean-hydrogen-bomb-claims9046. 28. Both space rockets and missiles to avoid the confusion of the so-called Leap Day Deal in 2012. See Ankit Panda, “A Great Leap to Nowhere: Remembering the U.S.-North Korea ‘Leap Day’ Deal,” The Diplomat, February 29, 2016. Melissa Hanham is a senior research associate at the James Martin Center for Nonproliferation Studies and the Mixed-Methods ­Evaluation, Training and Analysis (META) Lab of the Middlebury Institute of International Studies. Seiyeon Ji is a research assistant at the James Martin Center for Nonproliferation Studies. The treaty is the first international agreement that prohibits the use, possession, deployment, and stationing of nuclear weapons for all states-parties and challenges the legitimacy of nuclear deterrence policies.2 It opens for signature at the UN General Assembly in New York on September 20 and enters into force 90 days after the deposit of the 50th instrument of ratification. Dismissed by the nuclear-armed states and their allies, the impact of the treaty will become evident only over time. The treaty’s negotiators do not have illusions that the new instrument will produce immediate results in reducing nuclear risks or nuclear weapons. Instead, the aim is to delegitimize nuclear weapons and make it more difficult for states to continue to rely on nuclear weapons as part of their military and foreign policy strategies. Borne of a movement focused on the humanitarian impact of nuclear weapons use, the treaty commits its states-parties to conduct environmental remediation and provide assistance to victims of nuclear weapons use or testing under their jurisdiction and establishes the responsibility of states that use or test nuclear weapons to provide assistance to other affected parties. Further, the treaty mandates the destruction of nuclear arsenals, with a view that the details of nuclear weapons elimination would be negotiated at a later date. For the proponents of the ban, these developments underscored the urgency of negotiating a treaty to prohibit the use and possession of nuclear weapons. For the opponents, these issues only added to the list of problems the prohibition treaty cannot solve. Although the prohibition treaty was negotiated by mostly like-minded states, the deliberations did not escape some of the familiar problems and disagreements plaguing the debates at nuclear Nonproliferation Treaty (NPT) and International Atomic Energy Agency (IAEA) meetings, which affected some of the treaty’s provisions. A short negotiation time frame and the lack of a preparatory process, along with the absence of a number of states traditionally active in disarmament and nonproliferation forums, also influenced the process and substance of the talks. This article provides an overview of how the negotiators arrived at the final text of the prohibition treaty and discusses some of the substantive issues that generated the most debate. Given the apparently unbridgeable divide between the two sides of the debate on the desirability and timeliness of prohibiting nuclear weapons, the treaty was negotiated without the nuclear-weapon states and against their vocal opposition. Most European states were also absent, which was unusual for negotiations on a humanitarian treaty or indeed any UN-mandated process. On the other hand, civil society representatives from about 100 nongovernmental organizations actively participated and contributed to the process, which is unprecedented for nuclear weapons-related negotiations. The negotiations were complicated by severe time constraints and the fact that the negotiators could not benefit from the work of preparatory committees or specially designated expert groups.5 The need for additional technical expertise, for example, was evident during the work on safeguards and nuclear weapons elimination provisions. Although some states, including Egypt, questioned whether it was necessary to conclude the treaty this year, the core group of Austria, Brazil, Ireland, Mexico, and South Africa pressed early for a “lean” treaty that could be adopted without the need to ask the UN General Assembly for a negotiating mandate extension into 2018. With the uncertainty surrounding the Trump administration’s pending Nuclear Posture Review, the stalemate in U.S.-Russian arms control, growing tensions in East Asia, and continued nuclear-weapon-state opposition to the prohibition treaty, the political window for the negotiations seemed to be closing faster than could have been expected in October 2016. The longer the negotiations continued, the greater disagreements could become, and the greater potential for the prohibition negotiations and the periodic NPT review process to affect each other negatively. The March session was remarkable for its positive, business-like atmosphere. By the end of the week, most states’ positions converged around negotiating a short treaty establishing a strong prohibition on the use and possession of nuclear weapons. Some states, particularly Cuba, Egypt, Iran, and Venezuela, tried to broaden the scope of the future instrument, arguing for the inclusion of a time-bound disarmament program along with comprehensive prohibitions, but their views did not gain much traction. Most if not all delegations emphasized the importance of the NPT as the cornerstone of the international nonproliferation regime and argued that the new treaty should build on and strengthen the NPT rather than replace it. On the basis of the first week’s statements, as well as the states’ working papers and written products submitted directly to the president’s team, Whyte Gómez prepared the first draft of the treaty, which she distributed on May 22, a week after the 2017 NPT preparatory committee meeting concluded in Vienna. The timing was of some significance, as Whyte Gómez chose not to attend that meeting in an apparent attempt to keep the discussion of the draft treaty out of the preparatory committee as much as possible. The main negotiations on the text of the ban took place during the second session of the conference from June 15 to July 7. The first seven working days of the second session were spent reviewing the draft treaty paragraph by paragraph in the plenary. At the end of that period, it became evident that small-group negotiations would be necessary to address specific issues and resolve disagreements, even though such methods were not Whyte Gómez’s original preference. On June 29–30, four groups, led by Whyte Gómez and the facilitators she had appointed, convened in parallel and addressed the following: main prohibitions and obligations (Article 1), verification and accession of nuclear-armed states (Articles 2–4), victim assistance and environmental rehabilitation (Articles 5–7), and all other issues, including withdrawal provisions and institutional arrangements (Articles 8–20). The facilitators submitted their respective texts to Whyte Gómez as the products of their groups’ “best effort.” On July 3, at the beginning of the last week of the negotiations, Whyte Gómez released the draft final text based on the group submissions and additional consultations. States then had a little more than 24 hours until Wednesday, July 5, to review the draft final text and consult their respective capitals. Following the UN General Assembly’s rules of procedure meant that the conference needed only a two-thirds majority to adopt the text of the treaty, but it came closer to a consensus outcome than generally expected. On July 7, an impressive 122 states voted in favor, one against, and one state abstained. The Netherlands, the only NATO member to participate in the negotiations, consistently stated that it would not be in a position to support a treaty if the provisions were inconsistent with the country’s alliance obligations. Unsurprisingly, the Netherlands asked for a vote on the text of the treaty and voted against it. Singapore abstained, citing the extremely limited time available for the negotiations and the failure to include in the final text Singapore’s proposal regarding transit. After Sweden and Switzerland expressed concerns about some of the provisions, such as the inclusion of testing in the prohibitions, relatively weak safeguards requirements, and the relationship between the prohibition treaty and the NPT, there were questions as to whether they would abstain on the final text. Both states, however, judged that the treaty overall was an important step forward and voted in favor. The treaty prohibiting nuclear weapons is a highly controversial subject in the NPT context, with NPT states-parties sharply divided on its benefits, dangers, and expected long-term impact. The ban negotiations themselves, however, were not especially contentious in large part due to the absence of the nuclear-weapon states and most of their allies, and the collective drive to adopt a treaty by July 7 was at times almost palpable. After the first week in March, one could observe broad agreement among states on the treaty’s core prohibitions, such as the use, possession, production, stationing, and deployment of nuclear weapons, as well as assistance in prohibited activities. Still, a number of issues proved difficult for the delegations to conclude, including the prohibition on the threat of use of nuclear weapons and on testing and transit, verification, provisions for the accession of nuclear-armed states, withdrawal, and the relationship of the prohibition treaty with other instruments. The key difference appears to be in the interpretation of the nature of the threat that ought to be prohibited. The UN Charter prohibition seems to apply to a more immediate threat to use nuclear weapons against a particular state or states under specific circumstances. Those that argued for the inclusion of the threat of use in the prohibition treaty, however, were targeting nuclear deterrence policies more broadly because a general threat to use nuclear weapons in retaliation is at the core of nuclear deterrence. The latter logic ultimately prevailed, and the negotiators agreed to include “threaten to use” in the activities prohibited under Article 1 of the treaty. Testing. The disagreement over nuclear testing centered around the issue of whether its inclusion in the treaty’s prohibitions under Article 1 would be redundant because of the existence of the Comprehensive Test Ban Treaty (CTBT) and, more importantly, would undermine the efforts to bring the CTBT into force, which requires ratification by eight key states. Many states spoke in favor of including testing in the new prohibition treaty, arguing that this would strengthen rather than weaken the norm against nuclear tests, and a majority supported the reaffirmation of the CTBT’s importance in the preamble. The uneasy compromise devised by Whyte Gómez was to include “test” among the core prohibitions under Article 1(a), so that states-parties to the prohibition treaty would undertake “never under any circumstances to. . . test. . . nuclear weapons or other nuclear explosive devices.” This broad formulation did not fully satisfy either side of the debate. States such as Cuba, Iran, and Nigeria announced that they would interpret the text as encompassing “all forms” of nuclear testing, including subcritical, although that does not constitute an agreed interpretation of the conference. The broader interpretation means little in practical terms because there is no verification in place for subcritical testing and computer simulations, and the nuclear-armed states are not joining the prohibition treaty in the foreseeable future. Yet, it could exacerbate the criticism that the new treaty reinterprets or otherwise undermines existing instruments. Transit. Some of the most protracted debates at the conference involved transit. A number of countries, including Cuba, Ecuador, Guatemala, Indonesia, Kazakhstan, and Peru, called for an explicit prohibition on transit of nuclear weapons. Others, Austria and Mexico among them, argued against on the grounds that such a prohibition would be difficult to implement and verify. Transit constitutes one of the most sensitive points with regard to the relationship between the prohibition treaty and the nuclear-weapon-state policies. A direct prohibition on transit would have affected primarily the United States because its strategic nuclear submarines routinely patrol the Atlantic and Pacific oceans and would have benefitted the Russian position. Outside observers also saw the potential prohibition on transit as an indicator of a particularly anti-NATO, or anti-U.S., focus of the new treaty.12 Along with questions of implementation and verification, this consideration also must have weighed on the states urging caution with regard to banning transit. The issue also split the nuclear-weapon-free-zone parties. None of the existing nuclear-weapon-free zones prohibit transit: the Latin American and the Caribbean treaty does not mention transit at all, while others leave it to the individual states-parties to decide whether to allow transit, overflight, and visitation by vessels and aircraft carrying nuclear weapons. The subject is currently particularly controversial in the context of the Bangkok Treaty, where Singapore refuses to accept Russia’s proposed reservation that it would not be bound by the protocol to the Southeast Asian nuclear-weapon-free zone if a state-party allows transit of nuclear weapons.13 At the prohibition negotiations, Singapore proposed the inclusion of language based on the traditional nuclear-weapon-free-zone transit formulation (Article 7 in the case of Bangkok Treaty) and subsequently cited the rejection of this proposal among the reasons for abstaining on the treaty as a whole. Whyte Gómez ultimately decided that there was not sufficient agreement in the room to include transit in the treaty text. Speaking at the July 5 plenary, Cuba, Ecuador, and Peru indicated that they would interpret the prohibition on assistance under Article 1 as including transit. As is the case with testing, however, this should not be taken as an agreed interpretation of the negotiators as a whole. At the March session of the ban negotiations, several states raised the need for a verification regime and suggested that, for the verification of most prohibitions, the new treaty should rely on the existing IAEA safeguards system. Sweden and Switzerland, along with Chile, Liechtenstein, Netherlands, New Zealand, Thailand, and others, further argued that the treaty should adopt the highest available verification standard, which at present is the combination of comprehensive safeguards (INFCIRC/153) and the Model Additional Protocol (INFCIRC/540). Negotiations of the safeguards provisions, along with the articles on the accession of nuclear-armed states, were the most complex due to their technical nature and the pronounced political disagreement on the role and necessity of an additional protocol. An additional protocol to a country’s safeguards agreement provides the IAEA with additional tools to verify the absence of undeclared nuclear material and activities in a state along with the nondiversion of declared material. The measure was adopted as voluntary two decades ago, but more and more NPT states-parties have come to view it as an integral part of the verification standard for the non-nuclear-weapon states. Yet, attempts to recognize an additional protocol as part of the safeguards requirement under the NPT have failed due to strong opposition led by Argentina, Brazil, Egypt, and Iran. The prohibition treaty logically could have required states-parties to accept comprehensive safeguards and an additional protocol because the treaty’s prohibitions go beyond those in the NPT and the treaty was meant to strengthen the existing regime. At the same time, one could not realistically expect such an outcome, given the absence from the negotiations of many of the leading proponents of additional protocols and because this debate has not been settled in the NPT and IAEA contexts. States arguing for a higher verification standard in the prohibition treaty were cognizant of this reality and did not make the issue their redline for accepting the final draft. During the negotiations, Argentina, Brazil, and Egypt in particular opposed any attempts to broaden the safeguards requirements for states that never had nuclear weapons beyond INFCIRC/153. To avoid lowering the standard for those who already have an additional protocol in force, it was agreed, based on Ireland’s proposal, to require that states-parties at a minimum maintain the IAEA safeguards obligations they had at the time of the prohibition treaty’s entry into force. Aspirational language regarding possible future adoption of a higher verification standard also did not survive the opposition and was replaced with a reference to “any additional relevant instruments” that a state-party may adopt in the future. Nuclear-Armed States’ Accession and Elimination of Nuclear Weapons. A key idea underlying the calls for negotiating a prohibition treaty had been that it would establish a strong normative prohibition against possession and use, leaving the details on verifiable elimination of nuclear weapons to be negotiated at a later date, with the participation of nuclear-armed states. At the same time, UN General Assembly Resolution 71/258 mandated the negotiators to indicate some kind of a path toward the complete elimination of nuclear weapons. Furthermore, at the March session, many states and civil society representatives spoke of the need to include provisions obligating the nuclear-armed states, should they join the treaty, to eliminate their nuclear arsenals. These provisions proved particularly difficult to negotiate and underwent the most changes from the first draft to the final text. States decided to include in the treaty the “disarm and join” (the South African model) and “join then disarm” options for nuclear-armed states’ accession, but the latter approach in particular raised a range of serious issues.16 Those concerned verification, compatibility of Article 1 prohibitions with the accession of a state still in possession of nuclear weapons, and the timeline and procedure for agreeing to an elimination plan. The negotiators tried to balance the fact that none of the disarmament timelines and verification details could be agreed in the absence of nuclear possessors with the need to ensure that a nuclear-armed state joining the treaty could not retain its arsenal indefinitely while claiming to be in compliance. A nuclear-armed state-party would have to submit its proposed disarmament plan within 60 days of joining the treaty, to be negotiated with an authority designated by the states-parties. The states-parties would also designate a competent authority to carry out disarmament verification. The two authorities do not have to be the same, and the treaty leaves open the choice of what kind of a body it may be (e.g., an existing international organization, a new specially created organization, or a subsidiary body of the Meeting of States-Parties). The main reason behind pursuing the join-and-disarm option was allowing nuclear-weapon possessors to accede to the treaty and become bound by its prohibitions and other provisions before the lengthy disarmament process is completed. It appears unlikely, however, that any nuclear-armed state would use this option given that those countries would want to negotiate the terms of weapons elimination and verification first with each other. If they are to join the prohibition treaty together, it is more plausible that they would do so after concluding a disarmament agreement among themselves. Withdrawal. Since North Korea declared it would no longer be part of the NPT in 2003, the debate has been ongoing about the need to tighten the withdrawal provisions and ensure that any state that decides to withdraw from the NPT in the future bears serious consequences. That debate has not led to any concrete results in the NPT context, but the North Korean experience and concerns about states leaving the future prohibition treaty informed the deliberations about withdrawal provisions during the ban negotiations. In addition to extending the withdrawal notice period to 12 months versus the NPT’s three months, Article 17 of the prohibition treaty stipulates that if the withdrawing party is engaged in an armed conflict at the end of that 12-month period, the state would continue to be bound by the terms of the treaty. This provision aims to discourage states from withdrawing from the treaty to pursue nuclear weapons development because of a conflict. Yet, the article envisions no enforcement measures, and the treaty provides no role for the UN Security Council in case of withdrawal. Although it is unusual for treaties not to have withdrawal provisions altogether, a number of delegations argued that the very nature of the prohibition treaty is such that withdrawal should not be an option. It was also suggested that Article 17 should be deleted to allow the Vienna Convention on the Law of Treaties to apply in case of withdrawal. That convention stipulates that if a treaty does not have a specific withdrawal clause, leaving such treaty would be possible only if it was “established that the parties intended to admit the possibility of denunciation or withdrawal” or withdrawal is implied “by the nature of the treaty.”17 If one of those conditions is satisfied, a state would have to give at least a 12-month notice of withdrawal. The record that some of the negotiators expressed the view that withdrawal should not be allowed at all could have led to serious disagreements over the interpretation and application of the convention in case of future withdrawal. At the July 5 plenary, the conference appeared to remain evenly split between those in favor and against deleting Article 17. Whyte Gómez ultimately judged that there was not sufficient will in the room to eliminate the withdrawal provisions. It is remarkable that a treaty prohibiting nuclear weapons was concluded less than a year after the Open-Ended Working Group on Taking Forward Multilateral Disarmament Negotiations adopted a report recommending the commencement of negotiations. That 122 states voted in favor of the treaty’s final text sends a powerful message about the rejection of nuclear weapons as a legitimate instrument of national and international security. There is an extremely long way to go for the treaty to become customary international law,18 but if the number of states joining the ban grows steadily, so would the pressure on other countries to disavow nuclear weapons. Practical implications of the treaty in the near term remain uncertain. The prohibition treaty will not change the policies of nuclear-armed states overnight, much less make them disarm. In the short term, the most visible impact of the ban might be exacerbated acrimony in the NPT and other forums. France, the United Kingdom, and the United States met the adoption of the ban treaty with condemnation and a promise to never join it,19 and the nuclear-weapon states have reportedly discussed “the dangerous flaws” in the treaty.20 There is a real danger that the rest of the 2020 NPT review cycle will be consumed by the bitter disagreement and mutual accusations. It would be wrong to simply blame a controversial 2020 NPT review cycle on the Treaty on the Prohibition on Nuclear Weapons, given the crisis in U.S.-Russian nuclear arms control, North Korea’s demonstration of advanced nuclear and missile capabilities, anxiety about the developing new U.S. nuclear policy, arsenal modernization in all nuclear-weapon states, and no progress on the Middle Eastern zone free of nuclear and other weapons of mass destruction. Even without the ban, this would have been a difficult review cycle, but the treaty is likely to get most of the spotlight. There is no denying the profound divide among NPT states-parties on the value and legitimacy of nuclear weapons, but both sides could try to reduce tensions by shifting the attention elsewhere. States would have to acknowledge their disagreement and somehow put it aside, focusing instead on other issues, such as implementation of the 2010 action plan. Yet, it would require the nuclear-weapon states to put forth concrete proposals on disarmament measures they are planning to implement, and so far, there is little reason to believe this will happen in the near future. Both sides proclaim commitment to the NPT and bear the responsibility to try to continue working together, but the onus is on the nuclear-weapon states to put on the table a forward-looking agenda to back up their NPT nuclear disarmament commitments and obligations. disarmament/ptnw/webcast-english.html (accessed August 20, 2017). 2. UN General Assembly, “Treaty on the Prohibition of Nuclear Weapons,” A/CONF.229/2017/8, July 7, 2017. 3. For example, “Ukraine Conflict: Putin ‘Was Ready for Nuclear Alert,’” BBC News, March 15, 2015, http://www.bbc.com/news/world-europe-31899680. 4. Two U.S. representatives have introduced a bill attempting to strip the president of the sole authority to order a nuclear attack. Will Worley, “New Bill Aims to Ban Donald Trump From First Use of Nuclear Weapons Without Congressional Declaration of War,” Independent, January 25, 2017, http://www.independent.co.uk/news/world/americas/donald-trump-ban-use-nuclear-weapons-first-use-congressional-declaration-of-war-us-congressman-ted-a7545191.html. 5. The negotiations of the Arms Trade Treaty, for example, was preceded by three preparatory committee meetings, a group of governmental experts, and an open-ended working group. See Reaching Critical Will, “Arms Trade Treaty,” n.d., http://www.reachingcriticalwill.org/disarmament-fora/att (accessed August 20, 2017). The negotiators of the Comprehensive Test Ban Treaty, in drafting the verification provisions, drew on the work of the group of scientific experts that convened for more than two decades. See Preparatory Commission for the Comprehensive Nuclear-Test-Ban Treaty Organization (CTBTO), “1993–1995: Prelude and Formal Negotiations,” n.d., https://www.ctbto.org/the-treaty/1993-1996-treaty-negotiations/1993-95-prelude-and-formal-negotiations/ (accessed August 20, 2017). 6. For a detailed overview of the first week’s statements, see Olivier Meier, Sira Cordes, and Elizabeth Suh, “What Participants in a Nuclear Weapons Ban Treaty (Do Not) Want,” Bulletin of the Atomic Scientists, June 9, 2017, http://thebulletin.org/what-participants-nuclear-weapons-ban-treaty-do-not-want10829. For detailed accounts of both sessions and reviews of treaty drafts, see Alicia Sanders-Zakre, “Banning the Bomb” Arms Control Association, July 7, 2017, https://www.armscontrol.org/blog/2017/banning-the-bomb. 7. One substantive amendment to the July 3 draft that the president had to make was reintroducing the text into Article 7, previously agreed in the small group, on the responsibility of states using and testing nuclear weapons to provide assistance to affected state-parties. It remains unclear why the text was missing from the July 3 draft. 8. UN Charter, art. 2(4). 9. John Borrie et al., “A Prohibition on Nuclear Weapons: A Guide to the Issues,” International Law and Policy Institute and UN Institute for Disarmament Research (UNIDIR), February 2016, http://www.unidir.org/files/publications/pdfs/a-prohibition-on-nuclear-weapons-a-guide-to-the-issues-en-647.pdf. 10. See “Compilation of Amendments Received From States on the Revised Draft Submitted by the President Dated 30 June 2017; A/CONF.229/2017/CRP.1/Rev.1,” June 30, 2017, https://s3.amazonaws.com/unoda-web/wp-content/uploads/2017/06/CRP1_rev1_compilation_30-June-1-2_8pm.docx. 11. See “Complication of Amendments Received From States on the Revised Draft Submitted by the President Dated 27 June 2017; A/CONF.229/2017/CRP.1/Rev.1,” June 29, 2017, https://s3.amazonaws.com/unoda-web/wp-content/uploads/2017/06/CRP1_rev1_compilation_29-June-2.docx. 12. See Matthew Harries, “The Real Problem With a Nuclear Ban Treaty,” Carnegie Endowment for International Peace, March 15, 2017, http://carnegieendowment.org/2017/03/15/real-problem-with-nuclear-ban-treaty-pub-68286. 13. See Bilahari Kausikan, “Pragmatic Adaptation, Not Grand Strategy, Shaped Singapore’s Foreign Policy,” in Perspectives on the Security of Singapore: The First 50 Years, ed. Barry Desker and Cheng Guan Ang (Singapore: World Scientific Publishing Co., 2016), p. 303. 14. Adam Mount and Richard Nephew, “A Nuclear Weapons Ban Should First Do No Harm to the NPT,” Bulletin of the Atomic Scientists, March 7, 2017, http://thebulletin.org/nuclear-weapons-ban-should-first-do-no-harm-npt10599. 15. John Carlson, “Safeguards Challenges in the Nuclear Weapons Ban,” Arms Control Wonk blog, July 10, 2017, http://www.armscontrolwonk.com/archive/1203571/safeguards-challenges-in-the-nuclear-weapons-ban/. 16. Gaukhar Mukhatzhanova, “Provision for Nuclear-Armed States’ Accession,” in Negotiation of a Nuclear Weapons Prohibition Treaty: Nuts and Bolts of the Ban, UNIDIR, June 2017, pp. 27–34, http://www.unidir.org/files/publications/pdfs/nuts-and-bolts-en-684.pdf. 17. Vienna Convention on the Law of Treaties, May 23, 1969, 1155 U.N.T.S. 331, art. 56.1. 18. See Sebastian Brixey-Williams, “The Legal Implication of the Nuclear Ban: Separating Fact From Fiction,” Arms Control Wonk blog, May 26, 2017, http://www.armscontrolwonk.com/archive/1203288/brixey-williams-on-the-legal-implications-of-the-nuclear-ban/. 19. U.S. Mission to the United Nations, “Joint Press Statement From the Permanent Representatives to the United Nations of the United States, United Kingdom, and France Following the Adoption of a Treaty Banning Nuclear Weapons,” July 7, 2017, https://usun.state.gov/remarks/7892. 20. Robert Wood, August 2, 2017, https://twitter.com/USAmbCD/status/892679043279093760. Gaukhar Mukhatzhanova is director of the International Organizations and Nonproliferation Program at the James Martin Center for Nonproliferation Studies. She attended the treaty negotiations and served as an adviser to the delegation of Chile. Over the summer, there has been a re-energized push from the EU high representative for foreign affairs, Federica Mogherini, and the E3, that is, France, Germany, and the United Kingdom, urging the Trump administration to stay on board with the Iran nuclear deal, known as the Joint Comprehensive Plan of Action (JCPOA). This is a clear, immediate priority. The effort comes against the backdrop of not only the two years since the deal’s signing but also the four years of gradual rapprochement between Europe and Iran since 2013 when the nuclear talks intensified under Iran’s president, Hassan Rouhani. There has been a gradual normalization between the two sides from political and economic perspectives. Almost all if not all foreign ministers from the 28 members of the European Union have visited Tehran. Mogherini has been to Tehran on several occasions, taking along all of her commissioners to discuss issues from energy to economics to regional conflicts. Europeans are trying to use the JCPOA to open up space to discuss areas not only where there is common interest but also where there are real competition and differences with Iran, most notably in the Middle East where European interests are directly impacted by Iranian actions. There is a broad convergence between the United States and key European countries regarding threat perceptions on Iran. But the real difference with the Trump administration is, first of all, on what the end goal is with respect to Iran’s behavior. Is it a change in regime behavior, or is it effecting regime change completely? What is the process by which we go about dealing with Iran? With Rouhani winning a second term, there is a government in place that has a constructive attitude toward engaging in diplomacy on areas of difference. The region right now is very different from 2012, when the Europeans placed their harshest sanctions on Iran’s energy sector. There have been the failures of the Arab Spring, the surge of Islamic State and other extremist groups, and the increasing tension with some traditional regional allies, such as Saudi Arabia. The understanding in Europe is that although there is deep disagreement and deep distrust with Iran, it is no longer possible to ignore the country or to exclude it from discussions. This is a very stark difference from what we see coming out of the Trump administration, most notably at the Riyadh summit where President Donald Trump called on all nations of conscience to isolate Iran. In the coming months, there is likely to be an uptick in activity by the Europeans on transatlantic coordination on Iran policy. This will include outreach on Capitol Hill and to the White House, the State Department, and the Pentagon to outline the European position, to reiterate the consequences of unraveling the deal, and, probably in private, to advise that the Europeans may look to contingency plans and fallback options if the United States unreasonably undermines the deal. There might also be much more coordination than we have seen between the Europeans, the Chinese, and the Russians. In Washington, there is a lot of talk about co-opting or forcing Europeans to take the same position as the United States. I caution against underestimating the capacity of the Europeans to push back. This is not just about Iran policy. It is also about the idea of protecting international norms, international institutions, and the capacity of multilateral diplomacy to deliver. Given the downturn in U.S.-European relations on issues such as NATO policy and the Paris climate accord, the Iran nuclear deal is becoming an important parameter for Europeans on the issue of safeguarding international norms. We should not underestimate how much of a challenge it will be for the Europeans to put up a tough position against the Trump administration on the Iran deal, but we should not underestimate their capacity to do so at a time when European leaders are being pushed to demonstrate greater responsibility on foreign policy issues. Ellie Geranmayeh is a senior policy fellow for the Middle East and North Africa program at the European Council on Foreign Relations. This piece is adapted from remarks she made during a July 28 press briefing held by the group J Street.